Could Qaradawi Become Egypt's Khomeini? Yusuf al-Qaradawi is an Egyptian Islamic scholar associated with the Muslim Brotherhood. He is known for his militant religious rulings and political commentary in support of acts of terrorism and repression of women. He is currently the host of Al Jazeera's most popular show, "Shariah and Life," and, largely because of this, has become a very influential force among Muslims worldwide. Al-Qaradawi also serves as chairman of the board of trustees at the Islamic American University, a subsidiary of the Muslim American Society. Al-Qaradawi's fatwas, or religious edicts, have been numerous and far-reaching. Topics that have been influenced by al-Qaradawi's religious interpretation range from "justified" killings, to familial affairs and domestic conflict. Additionally, al-Qaradawi has made a number of public speaking appearances, both in the U.S. and abroad, where he has further expounded his often contentious doctrine. In 1995, at a conference held by the Muslim Arab Youth Association (MAYA) in Toledo, Ohio, al-Qaradawi said, "Our brothers in Hamas, in Palestine, the Islamic resistance, the Islamic Jihad, after all the rest have given up and despaired, the movement of the Jihad brings us back to our faith." What remains, then, is to conquer Rome. The second part of the omen. "The city of Hiraq [once emperor of Constantinople] will be conquered first", so what remains is to conquer Rome.' This means that Islam will come back to Europe for the third time, after it was expelled from it twice… Conquest through Da'wa [proselytizing], that is what we hope for. We will conquer Europe, we will conquer America! Not through sword but through Da'wa. But the balance of power will change, and this is what is told in the Hadith of Ibn-Omar and the Hadith of Abu-Hurairah: "You shall continue to fight the Jews and they will fight you, until the Muslims will kill them. And the Jew will hide behind the stone and the tree, and the stone and the tree will say: ‘Oh servant of Allah, Oh Muslim, this is a Jew behind me. Come and kill him!' The resurrection will not come before this happens." This is a text from the good omens in which we believe." In January 1998, the Associated Press quoted al-Qaradawi as writing, "There should be no dialogue with these people [Israelis] except with swords." And in April 2001, commenting on suicide bombings, he said, "They are not suicide operations…These are heroic martyrdom operations." In the June 2002 Fatwa section of The American Muslim, a publication of the Muslim American Society, al-Qaradawi was asked "Prophet Muhammed said that nations will haunt against us. Can we say that this is happening right now?" He responded, "The emergence of the Islamic awakening has breathed in the Muslim nation a sense of confidence and hope in the future. Such movement is worthy of leading the Muslim nation to utter victory once there are leaders who are rightly guided by Almighty Allah and filled with wisdom." In 2004, in response to a question regarding the permissibility of female suicide bombers, al-Qaradawi encouraged such acts, stating, "The martyr operations is [sic] the greatest of all sorts of Jihad in the Cause of Allah." Al-Qaradawi issued a fatwa stating that Muslims killed fighting American forces in Iraq are martyrs. "Those killed fighting the American forces are martyrs given their good intentions since they consider these invading troops an enemy within their territories but without their will," Qaradawi also stated, "Although they are seen by some as being wrong, those defending against attempts to control Islamic countries have the intention of Jihad and bear a spirit of the defense of their homeland." Criticizing religious rulings against suicide bombings, al-Qaradawi stated, "I am astonished that some sheikhs deliver fatwas that betray the mujahideen, instead of supporting them and urging them to sacrifice and martyrdom." Regarding one of these fatwas issued by the imam of Mecca's Grand Mosque, al-Qaradawi said, "It is unfortunate to hear that the grand imam has said it was not permissible to kill civilians in any country or state, even in Israel." Interestingly, his positions are criticized in some circles as being insufficiently extreme. While he has spoken out in support of suicide bombings – his condemnation of the 9/11 attacks, his lack of support for offensive jihads, and his refusal to condemn singing and movies have earned him the ire of some. For instance, in reaction to an al-Qaradawi fatwa that stated Muslims are allowed to sell pork and alcohol, the editors of the website of the Italian Muslim Assembly posted a letter under the heading, "A Warning for the Ummah against the Heretic Yusuf al-Qaradawi." The letter read, "Dr. Qaradawi is today the public enemy N° 1 for Ahlu-s-Sunnah wa-l-Jama'ah [Families of the Sunnis and the Community]." …the patch of the Muslim state will expand to cover the whole earth and that the strength of this state will grow and become obvious to all. This also denotes good news for the long-cherished hope of revival of Muslims unity and rebirth of Islamic Caliphate. Very much connected to his views on the Caliphate is al-Qaradawi's harsh treatment of those who apostatize from Islam. This "apostate," said al-Qaradawi in a June 2002 fatwa, "is no more than a traitor to his religion and his people and thus deserves killing." While al-Qaradawi does admit that Muslim jurists "differ regarding the punishment [of apostates]," it is readily apparent that he includes himself among "[t]he majority of them [that] go for killing; meaning that an apostate is to be sentenced to death." Because of his natural ability and his responsibility for providing for his family, the man is the head of the house and of the family. He is entitled to the obedience and cooperation of his wife, and accordingly it is not permissible for her to rebel against his authority, causing disruption. Without a captain the ship of the household will flounder and sink. If this was where al-Qaradawi's views ended, then his views on women, while excessively traditional, would not stand out. However, al-Qaradawi goes on to support domestic violence, female genital mutilation (a.k.a. female circumcision) – a practice deemed to bring about "universally unacceptable harm" by the World Health Organization (WHO) and the United Nations (UN). On his Al-Jazeera program in a discussion regarding spousal abuse, al-Qaradawi said that hitting one's wife is the last resort, and continued, "There is a woman who cannot agree to being beaten, and sees this as humiliation, while some women enjoy the beating and for them, only beating to cause them sorrow is suitable…"
On female circumcision, al-Qaradawi has said that, while not obligatory under the laws of Islam, "whoever finds it serving the interest of his daughters should do it, and I personally support this under the current circumstances in the modern world." "Departments – University," Muslim American Society Website, http://www.masnet.org/university.asp (Accessed August 17, 2007). Yousef al-Qaradawi, MAYA Conference, 1995, Toledo, Ohio. "Leading Muslim Cleric Under Fire for Meeting Israeli Chief Rabbi," AP Worldstream, January 7, 1998, quoting a January 6, 1998, article by Qaradawi in the Arab newspaper Al-Shaab. Al Raya, April 2001, quoted in Michael Slackman, "Islamic Debate Surrounds Mideast Suicide Bombers," The Los Angeles Times, May 27, 2001. Sheikh Yusuf Al-Qaradawi, "Fatwa: Questions Concerning Palestine," American Muslim, June 2002, 36-37. Yusuf al-Qaradawi, "Palestinian Women Carrying Out Martyr Operations," IslamOnline.net, http://www.islamonline.net/servlet/Satellite?pagename=IslamOnline-English-Ask_Scholar/FatwaE/FatwaE&cid=1119503545134 (Accessed August 17, 2007). Nur Eddin Al-Uwaydidi, "Those Who Die Fighting U.S. Occupation Forces Are Martyrs: Qaradawi," IslamOnline.net, http://www.islamonline.net/english/news/2003-01/28/article08.shtml January 27, January 27, 2003 (Accessed August 17, 2007). Haim Malka, "Must Innocents Die? The Islamic Debate Over Suicide Attacks," Middle East Quarterly, Spring 2003. "A Warning for the Ummah against the Heretic Yusuf al-Qaradawi," Italian Muslim Assembly, November 7, 1999, http://www.amislam.com/qaradawi.htm (Accessed August 17, 2007). Hamdy Al-Husseini and Abdullah Farag, "IAMS delegation to visit Darfur," IslamOnline.net, http://www.islamonline.net/English/News/2004-09/01/article02.shtml (Accessed August 23, 2007). For Muslims to Regain Lost Glory, IslamOnline.net, http://www.islamonline.net/fatwa/english/FatwaDisplay.asp?hFatwaID=64602 (Accessed August 23, 2007). "Donating Organs to non-Muslims," Fatwa Bank, IslamOnline.net, http://web.archive.org/web/20031004013624/http:/www.islamonline.net/fatwa/english/FatwaDisplay.asp?hFatwaID=49276 (Accessed August 23, 2007). 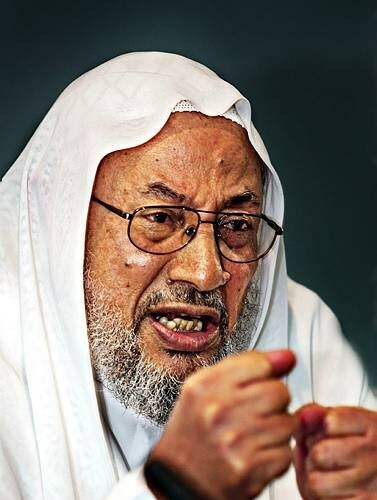 Yusuf al-Qaradawi, Source of the Punishment for Apostasy, IslamOnline.net, http://web.archive.org/web/20041011004537/http:/islamonline.net/fatwaapplication/english/display.asp?hFatwaID=102152 (Accessed August 23, 2007). Yusuf al-Qaradawi, The Lawful and the Prohibited in Islam, (Kuwait: International Islamic Federation of Student Organization, 1984) p. 205-06, translated at MEMRI, http://memri.org/bin/articles.cgi?Page=archives&Area=sr&ID=SR2704#_edn4 (Accessed August 23, 2007). "Female Genital mutilation – A joint WHO/UNICEF/UNFPA statement," World Health Organization, http://www.who.int/reproductive-health/publications/fgm/fgm_statement.html (Accessed August 23, 2007). Steven Stalinsky and Y. Yehoshua, "Muslim Clerics on the Religious Rulings Regarding Wife-Beating," MEMRI, Special Report #27, March 22, 2004 http://memri.org/bin/articles.cgi?Page=archives&Area=sr&ID=SR2704 (Accessed August 23, 2007). "Islamic Ruling on Female Circumcision," Fatwa Bank, IslamOnline.net, http://www.islamonline.net/servlet/Satellite?pagename=IslamOnline-English-Ask_Scholar/FatwaE/FatwaE&cid=1119503543886 (Accessed August 23, 2007).